Many great artists have had at least intermittent doubts about their own abilities. But The Education of Henry Adams is surely one of the few masterpieces to issue directly from a raging inferiority complex. The author, to be sure, had bigger shoes to fill than most of us. Both his grandfather and great-grandfather were U.S. presidents. His father, a relative underachiever, scraped by as a member of Congress and ambassador to the Court of St. James. But young Henry, born in Boston in 1838, was destined for a walk-on role in his nation's history--and seemed alarmingly aware of the fact from the time he was an adolescent. It gets worse. For the author could neither match his exalted ancestors nor dismiss them as dusty relics--he was an Adams, after all, formed from the same 18th-century clay. "The atmosphere of education in which he lived was colonial," we are told, revolutionary, almost Cromwellian, as though he were steeped, from his greatest grandmother's birth, in the odor of political crime. Resistance to something was the law of New England nature; the boy looked out on the world with the instinct of resistance; for numberless generations his predecessors had viewed the world chiefly as a thing to be reformed, filled with evil forces to be abolished, and they saw no reason to suppose that they had wholly succeeded in the abolition; the duty was unchanged. Here, as always, Adams tells his story in a third-person voice that can seem almost extraplanetary in its detachment. Yet there's also an undercurrent of melancholy and amusement--and wonder at the specific details of what was already a lost world. Continuing his uphill conquest of the learning curve, Adams attended Harvard, which didn't do much for him. ("The chief wonder of education is that it does not ruin everybody concerned in it, teachers and taught.") Then, after a beer-and-sausage-scented spell as a graduate student in Berlin, he followed his father to Washington, D.C., in 1860. There he might have remained--bogged down in "the same rude colony ... camped in the same forest, with the same unfinished Greek temples for workrooms, and sloughs for roads"--had not the Civil War sent Adams p�re et fils to London. Henry sat on the sidelines throughout the conflict, serving as his father's private secretary and anxiously negotiating the minefields of English society. He then returned home and commenced a long career as a journalist, historian, novelist, and peripheral participant in the political process--a kind of mouthpiece for what remained of the New England conscience. About Henry Adams (Author) : Henry Adams is a published author. 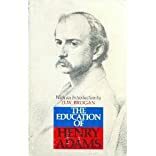 Some of the published credits of Henry Adams include Democracy An American Novel, The Education of Henry Adams (Unabridged). About D. W. Brogan (Introduction) : D. W. Brogan is credited in . Published credits of D. W. Brogan include The Education of Henry Adams: An Autobiography (Oxford World's Classics).